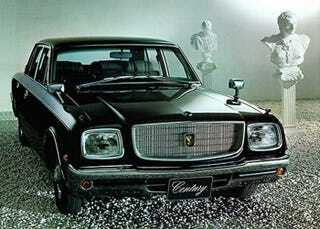 Luxury automotive design peaked with the late 1970s E-VG35 chassis Toyota Century. Luxury automotive design peaked with the late 1970s E-VG35 chassis Toyota Century. That’s why I park mine on stones in the middle of my minimalist art garden. Its comfortable and accommodating rear seats are the best place from which to admire my busts.